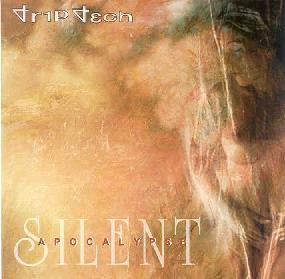 Trip Tech - "Silent Apocalypse"
I reviewed the bands previous CD a while back and was very interested to hear the latest one. "Cave of the Dark Monks" starts things off for the 55 minute trip into the dark spaces of your mind. The birds sounds slowly build on this track and it continues into "Forsaken". "Sugar Crystals" starts a large climb out of the dark, so to speak, with some eerie keyboards. "Genetic Polarities" brings in some sort of rhythm that some really cool keyboards with long delays are layered upon. "Spoken Silence" breaks things up with the female human voice, for which I could not find out who it was. She sings as synth waves come across the sound and pan, swirl and space out. "Burning Inside" somehow makes you feel like something really horrible is about to happen. The next track, "Negative Space" starts with virtually identical keyboard lines but go into a different space. The CD ends with the birds coming back and "Out of the Trees". Another very successful trip to the other side. Enjoy.